Many houses built before the 1950’s have what is known as knob & tube wiring. We can determine if you have this type of wiring in your home, by closely inspecting your basement or attic. To determine if your home is wired “knob & tube”, we look for ceramic knobs or tubes in which the wire gets attached to, or passes through, joists or studs. If the knob & tube wiring is not easily visible, we can usually tell by looking at your electrical outlets and switches. You may only have two prong outlets to plug into. Basically, no ground at each outlet or fixture outlet means knob and tube wiring is present, likewise if you have older pushbutton switches, this is also a good sign you may have knob and tube in your home. Home owners with knob & tube wiring may find it nearly impossible to obtain insurance on their home. Most insurance companies will not insure a house they deem as risky. Insurance companies may require a certificate of inspection and compliance from a licensed electrician, that all knob & tube has been removed and replaced with modern wiring and circuits before they will insure your home. After a licensed electrician rewires your home, they give you a satisfactory assessment of your home, and the insurance company will consider giving an insurance policy for your house. Knob & tube wiring does not provide a third wire for grounding and is therefore considered unsafe in kitchens, bathrooms, laundry rooms and outdoors. In other areas, knob & tube wiring that is in good condition with sheathing intact, properly protected from damage, and that hasn’t been subjected to extended periods of overloading which can cause it to become brittle, should not pose an increased safety risk. Aside from the preceding concerns, the primary risk with knob & tube wiring, it seems, is its relative accessibility for amateur repairs, upgrades and maintenance. It is not uncommon to see a system with knob & tube wiring that has a history of amateur work. If a house does have knob & tube wiring it should be inspected to ensure that it is properly installed and in good condition. If a few, but not all, of the circuits are in poor condition they can be replaced eventually without rewiring the whole house. However, if most or all of the circuits are in poor condition, it may be more economical to completely rewire the home. 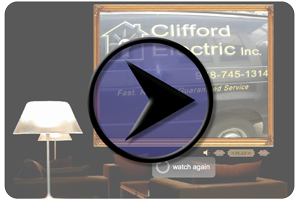 At Clifford Electric, our professional electricians can rewire your home, removing unsafe knob & tube wiring, replacing it with modern electrical circuits. Knob & tube wiring is a safety concern due to it’s tendency to overheat, especially when insulation is packed around it. The risk of fire is much higher with knob & tube wiring for many reasons. Age, the condition of the wiring, and increased overuse of the circuits can result in a fire hazard. This has become a concern with insurance companies, they no longer want to insure houses with more than one circuit of knob & tube.